I am curious what the science is for that. 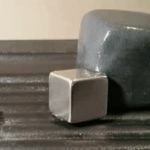 Magnetic putty to be precise. I looked it up. That stuff is nerd cool! Maybe some kind of magnetism. Looks like it is on a hot plate. If you're an EU4 player, you'll get the meme. They sell the stuff on vat19.com under the name "crazy arron"